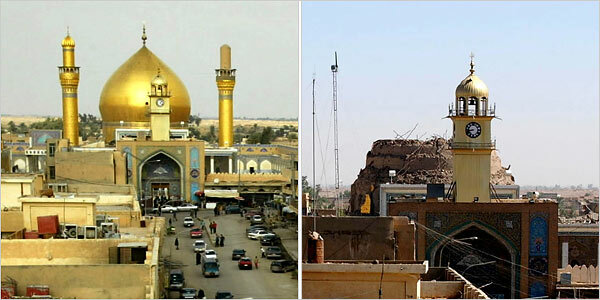 Wednesday’s tragic destruction of the minarets at the already crippled al-Askari mosque in Samarra has dealt the Iraqi government and the U.S. position still another moral and strategic blow. The NYT article detailing Wednesday’s attack leads with this visual comparison, juxtaposing the mosque in December ’03, when still completely intact, with the post-Wednesday view. In the coverage of the war, however, now over four years old, what is rarely conveyed is the process of erasure. That’s why — as a metaphor for the progressive nature of how Iraq has been losing its face, its character, its mind — I thought a different comparison might be relevant. What you see above are two images from the NYT slide show accompanying their article. The first offers the mosque complex following the attack that destroyed the dome in 2006 (and threw the country into sectarian civil war). The second shot, photographed facing the wall situated immediately to the girl’s right, shows the ruin after Wednesday’s attack, highlighting a hauntingly expansive — and empty — blue sky. Admittedly an editorial detail, the “disappearance” of the child only makes the scene, and situation, feel that much more forsaken.